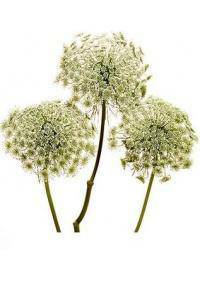 Queen Ann's lace is best known as the wild carrot or bird's nest. These soft blooming plants are biennial, meaning they last two years. This may also mean that it can take up to two years for it to bloom. It is grown in many parts of North America and in much of Europe. It is fairly hardy and can be introduced easily to nearly any garden. It can be fairly easy to grow and will spread in any conditions. In many areas, daucus carota is considered to be a common pest. It grows rapidly and will spread quickly through pastures and fields. In many areas, this species is considered to be a weed and mowed. Problems often arise as the seed bank will remain in soil for years. This means plants may grow for up to five years after their removal. This can make them difficult to remove in areas they are not wanted. The wild carrot seeds are also often confused with true carrot seeds. As seeds look nearly identical they may become mixed up in packs. This may cause incorrect sorting and lead to the wrong plant growth. An annual species has been introduced to combat the invasive problem. The flowers are very similar but they are not biennial like others. New plants are simply grown from seed every year then cut down. Annual seeds make it easier to grow Queen Ann's lace in gardens. These blooms also attract butterflies, making them a popular choice. Butterflies are attracted to both annual and biennial seed versions. Its accessibility and durability make Queen Ann's Lace a popular choice for elegantly accenting floral arrangements. Especially available in areas like Westminster, CA, Wichita Falls, TX, Joliet, IL, Boulder, CO, and Green Bay, WI, this flower's appearance is sought after with flowers like roses and lilies to give them a more pronounced look. In the wild, growing conditions are fairly minimal for rapid growth. Soil conditions are less of a concern in the wild, allow more plants. As a result, blooms may not appear as full as in a garden setting. Garden annuals are often given better soil conditions to thrive in. Well drained soil that is not too rocky or clay filled is optimal. Soil should not be too acidic or alkaline for the best bloom show. Full sun can be used but a partial sun location is often the best. Full shade or full sun may lead to a decrease in blooms or growth. Partial shade may also be recommended for those using containers. Water needs are average to minimal depending on the species used. Over watering is a common problem that should be avoided for plants. Soil should be moist to slightly dry before watering them again. Larger containers can be used to grow these for patio ornaments. Some may also choose to line patios or fences with these soft blooms. They can create a delicate level of privacy that attracts butterflies. This delicate bloom represents sanctuary and security when given. These blooms are often used as a filler in many cut arrangements. They can create a delicate backdrop for roses or other deep blooms. When used on their own, they can demonstrate serenity and peace. The association with royalty and queens make them ideal for mothers. These may make a good choice for a baby shower or new mother. They are also used with dry arrangements as a light filler flower. Similar to live bouquets, dried flowers are fragile and need care. Sprays of Queen Ann's lace can give dried blooms a good contrast.